Rotherham produced a terrific first-half display against Bolton to set up their second league win in 15 matches. Ben Pringle volleyed Conor Newton's cross home before Conor Sammon netted his first Rotherham goal on 22 minutes. Matt Derbyshire set up Sammon's tap-in and Paul Green's glancing header, before Derbyshire smashed in the Millers' fourth after the interval. Liam Trotter and Matt Mills reduced the arrears, but Rotherham moved five points clear of the relegation zone. Bolton, on 33 points, are only four points better off than the hosts but went into this game on a run of only one defeat in their last 11 league games. Their form since Neil Lennon took charge in October has been in stark contrast to their early season results. but a horror opening period left the visitors with too much to do, despite a late rally. Pringle was on hand at the back post to turn home a delivery from Newton - making his first start for Steve Evans's side since his move from Newcastle last summer - and though Bolton rallied, Eidur Gudjohnsen was denied the chance to level by Richie Smallwood's sliding tackle. Derbyshire was the game's stand-out player and his effort - saved by Andy Lonergan - left on-loan Derby forward Sammon with an easy goal. Sammon had only managed one goal in 19 league appearances while on loan at Ipswich earlier in the campaign, but gave his new side a platform to go on and secure their sixth win of the season. Green's header put the home side 3-0 up by the break and Derbyshire all but ended the contest on 57 minutes after he glided unopposed through the Bolton midfield to blast his second goal of the season into the top corner. Trotter struck a consolation with 13 minutes left when he latched onto a knockdown from Mills, who bundled in a header two minutes later to add some respectability to the scoreline. However, no late surge arrived as Rotherham made sure of their first home win in nine matches. 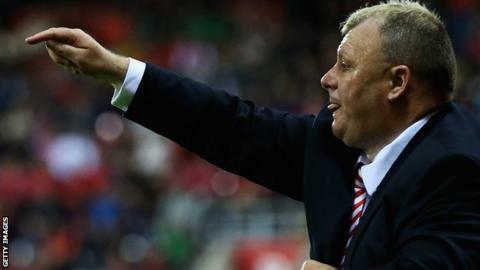 Rotherham manager Steve Evans: " We're absolutely delighted because we asked the players to be full of endeavour and spirit. "It's a stunning goal from Matt and I thought he was absolutely awesome for an hour before he tired a bit. It wasn't just his goal, his all round performance was stunning." Bolton manager Neil Lennon: "It was a good time for Rotherham to play us. We just have to accept this one and come back really strong for Wolves on Saturday. "We looked leggy. I think the season is just biting us in terms of the strength in depth in the squad." Match ends, Rotherham United 4, Bolton Wanderers 2. Second Half ends, Rotherham United 4, Bolton Wanderers 2. Attempt missed. Neil Danns (Bolton Wanderers) right footed shot from outside the box is close, but misses to the left from a direct free kick. Liam Trotter (Bolton Wanderers) wins a free kick in the attacking half. Foul by Paul Green (Rotherham United). Substitution, Rotherham United. Richard Wood replaces Conor Sammon. Attempt missed. Ben Pringle (Rotherham United) left footed shot from outside the box is too high. Assisted by Paul Green. Goal! Rotherham United 4, Bolton Wanderers 2. Matt Mills (Bolton Wanderers) header from very close range to the centre of the goal. Goal! Rotherham United 4, Bolton Wanderers 1. Liam Trotter (Bolton Wanderers) right footed shot from the centre of the box to the bottom left corner. Assisted by Matt Mills with a headed pass. Substitution, Bolton Wanderers. Jay Spearing replaces Eidur Gudjohnsen. Delay in match Conor Sammon (Rotherham United) because of an injury. Delay in match Darren Pratley (Bolton Wanderers) because of an injury. Corner, Bolton Wanderers. Conceded by Kári Arnason. Craig Morgan (Rotherham United) wins a free kick in the defensive half. Corner, Bolton Wanderers. Conceded by Ezekiel Fryers. Attempt blocked. Liam Feeney (Bolton Wanderers) right footed shot from outside the box is blocked. Assisted by Matt Mills. Attempt blocked. Liam Feeney (Bolton Wanderers) left footed shot from the centre of the box is blocked. Assisted by Darren Pratley with a headed pass. Attempt blocked. Conor Newton (Rotherham United) right footed shot from outside the box is blocked. Substitution, Bolton Wanderers. David Wheater replaces Conor Wilkinson. Corner, Rotherham United. Conceded by Andy Lonergan. Attempt saved. Conor Sammon (Rotherham United) header from the centre of the box is saved in the top centre of the goal. Assisted by Conor Newton. Attempt blocked. Liam Feeney (Bolton Wanderers) right footed shot from the centre of the box is blocked. Assisted by Liam Trotter with a headed pass. Goal! Rotherham United 4, Bolton Wanderers 0. Matt Derbyshire (Rotherham United) left footed shot from outside the box to the top right corner. Assisted by Richard Smallwood.